I recently had a friend of mine ask me about the viability of writing a book for his open source project. He had questions about how to submit a proposal as well as the money involved. I wrote him a detailed response, but decided to post some of my lessons learned here. This is definitely a worn out expression. I have seen people get this starry gleam in their eye, Sorry, but that only happens when you write a best selling, fictional trade novel. Not everyone can be J.K. Rowling. In fact, there are actually a very small number of authors who make it big. The real name of the game in writing is to write LOTS of books, such that over time, people that like your material end up buying all your titles. When writing technical books, you still need to sell a bunch to really make any money, but we are forever cursed by books going out-of-date in just a few years. Trade novels last a lot longer. That may sound a tad depressing. So why write book? Because it can open doors you never knew would happen. When you are a published author, it can impact interviews, speaking engagements, consulting opportunities, and other things. It is always a major +1 to your CV to have written a title. Even more if you get several under your belt. It also increases your overall name recognition and personal brand. Before expending any effort in writing, I made sure we had a contract in place that we both agreed to. I’ve read article where people keep writing chapter after and yet have not signed an agreed upon contract. I don’t work that way. You are taking on risk by doing that. Until a contract is in place, the publisher can bring onboard other writers. I have historically preferred to write my titles by myself. It lets me control the content 100% and not have to deal with interacting with another author, one who might/might not be as motivated as me. As a nice side effect, it also ensures that I get all the money. Since we’re already talking about a small pile of money, it feels counter production to split it up amongst two or three people. Packt’s contracts include an option of first refusal for your next two titles. I understand Packt’s desire to get first dibbs on future work. It make business sense, so I had no issue with this in my first two titles. But on the third one, I had decided they had made enough money on me. I asked that this clause be removed to liberate me for future works. I have no hard feelings nor have I felt any malice from anyone at Packt. Be sure to understand that the contract includes deadlines and exactly how much money you’ll be paid and when. If you sign the contract, you are agreeing to everything stated. Understand what you are agreeing to. Every publisher out there will probably tell you how glorious their marketing and sales team is. But for you to write a book and make no mention on Twitter/FaceBook/Google+, nor to write a peep on your blog site is ridiculous. You should be blogging all the time as you write and beyond publishing. Don’t assume that your publisher will automatically sell 1000 copies of your book and be fired up to order another batch! Another aspect of “acting accordingly” is to remember this will reflect first and foremost on YOU. If you have a certain voice or a style of presentation when you speak at conferences, then by all means, try to write that into your manuscript. Your editors may try to edit that out. If you give them the upper hand, they can reduce your effuse writing into boring humdrum. I’ve seen editors edit out some of my sassy writing. My response? I edit it back in! They don’t usually push back too hard. It’s important that the publisher have a certain level of quality. But there needs to be enough of YOU in whatever you write that makes it stand out. Go and read other people’s technical books. Part of this inspiration for me came from a couple other technical books I read. The style these author’s wrote knocked me out of my chair. I LOVED the small jokes, clever class names, and funny material they injected into their writing. And it told me I could do the same, as long as it wasn’t offensive or obnoxious. Again, my editors pushed back, but I paid keen attention to EVERY edit, and undid several of these. I wanted my book to be fun. Making your book fun is no one’s job but yours. In my latest title, I started each chapter with a quote from twitter. “Spring Boot” was so hot, that I started collecting tweets as I wrote. I would launch a chapter, and include a link to that user’s twitter handle. Their comments were inspirational. I hope they picked up new followers. At the same time, I gave a presentation that pre-dated release of my book. I mocked up a logo of the book with the title in it, and included that in my profile slide at the beginning. This was a PR moment I wouldn’t pass up. I wanted everyone in that audience to know a book was coming, and hopefully they all bought a copy! Finally, I wrote my last title using asciidoctor thanks to Dan Allen. This was by far the best option. It allowed me to focus on quality content and not idiotic Word Processor issues. Okay, all these suggestions up to this point are nice and all, but it’s all for naught unless you put in the hours to actually write your book. I read someone’s blog article where they thought the deadlines were crazy since they only planned to write on the weekends. Sorry, but I don’t have much sympathy there. I wrote each of my books while we also had a newborn baby. I quickly adopted the style of writing every night after everyone had gone to bed. This way, I could focus with no distractions, and then take the weekend off. Writing every night from 10pm-midnight can be exhausting when you mix it with feeding a baby at 2 AM, but this ensured that I got my book finished and out the door. It also cut down on the risk of my technology moving away from me too quickly and making the material invalid, or avoiding massive rewrites due to mega-changes. Another thing you have to be ready to do is carry your book all by yourself. You can’t depend on certain reviewers to fix things for you. Instead, you need to be ready to proof read in the event your book reviewers don’t actually give you any feedback until the last minute. It’s sad, but this still reflects on you. There were times when I hit bugs in my sample code, and had to simply pack up for the night. There were other times when I had no choice but to work an extra two hours to hammer out a problem that no one else could help me with, either in my asciidoctor backend, or in my sample code. After all, no one was going to pick this up and fix it, right? Leaning on pull requests, etc. is no excuse for not writing your book. I demoed Spring Social GItHub in my latest book, and had to go to press using version 1.0.0.BUILD-SNAPSHOT because the project lead was simply too backed up to fix the milestone release already published which broke my book’s sample code. Them’s the breaks. So by now, if I haven’t smashed your dream of writing a technical book too badly, I wish you only the best in going out, submitting a proposal, and snagging a contract. 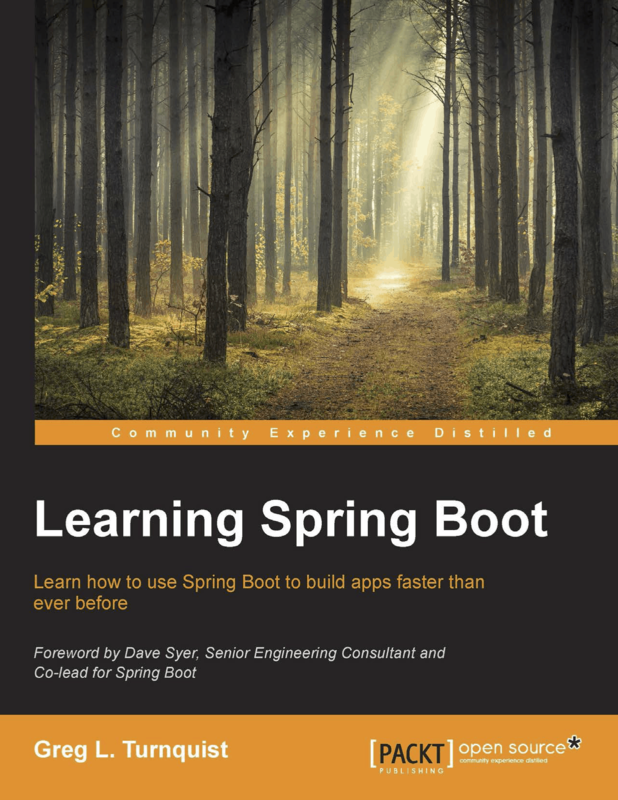 One week left for #LearningSpringBoot contest! Thank you for posting this Greg. It’s really interesting to see the experience of writing for Packt narrated from the author’s side. And even more, thanks for pushing through the dip and delivering some great books.